Fit Pit Woman is lightly perfumed with Rosemary and Bergamot essential oils. A wonderfully subtly scented cream deodorant, you simply apply with your fingertips. It melts on contact with warm skin so no waiting to dry and no nasty white stains. 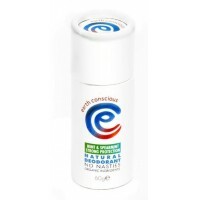 The newest member of the Earth Conscious family, this natural deodorant stick is applied directly fr..